Bishop John Kirby has paid tribute to the Irish Chaplaincy in Britain as a model of best practice in welcoming the stranger. 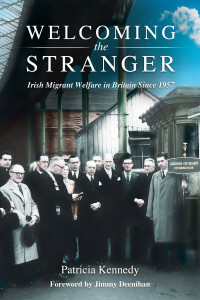 In his address to launch ‘Welcoming the Stranger – Irish Migrant Welfare in Britain since 1957’ by Dr Patricia Kennedy of UCD, the bishop said that with the exception of a brief period in the last ten years, net outward migration has always been a strong vein running through the narrative of Ireland’s history. This emigration was most evident during the Great Famine period, but also during the dark days of the 1950s and the 1980s. The chair of the Irish Episcopal Council for Emigrants said every family and parish felt the pain and loss which was sometimes akin to bereavement. Speaking at the Irish Embassy in London, Bishop Kirby paid tribute to His Excellency, Mr Daniel Mulhall, Ambassador of Ireland to Great Britain, and Mrs Greta Mulhall, who hosted the event. Paying tribute to Dr Kennedy for the important and significant research in the book, the Bishop said that before reading Welcoming the Stranger he was largely unaware of the extent of the selflessness and the commitment of so many lay people, religious sisters, and clergy in this mission to Irish emigrants in Britain for over half a century. 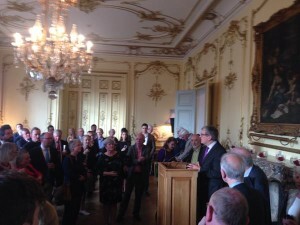 He said Dr Kennedy’s work has a reach that goes beyond the story of the migration of Irish people to Britain; “this work has a global significance”. The Bishop, who acts on behalf of the Episcopal Council for Emigrants said it would be remiss not to think of those who travel across the Mediterranean Sea and in doing so put their lives in danger. 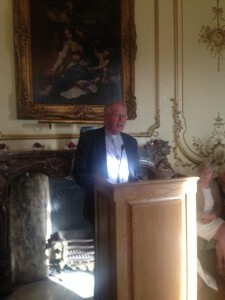 One point Bishop Kirby sought to emphasize was that when one looks at the work undertaken on behalf of Irish prisoners in the campaign to free those wrongly imprisoned, and separately at the achievements of the Task Force on Emigration, it is clear that in order to achieve significant outcomes for those living overseas, connection with the homeland is vital. By homeland, he said he meant that the emigrant has to occupy a space in the heart of the people of Ireland. He said the book’s research highlighted the importance of supporting emigrants maintaining contact with their homeland; the importance of providing assistance to new emigrants; placing people at the heart of migrant policy; and, encouraging the work of integration. Another point highlighted by the book relates to reports of the ‘ghettoisation’ of emigrant communities. “Those looking in from the outside can often accuse those who work with migrants of creating ‘ghettos’. This research challenges those who hold this view,” he highlighted. Bishop Kirby also said that while Irish migrants were not without stigma in some of their host communities, Ireland was fortunate that the Irish who travelled to Britain didn’t have to worry about visas or quotas.